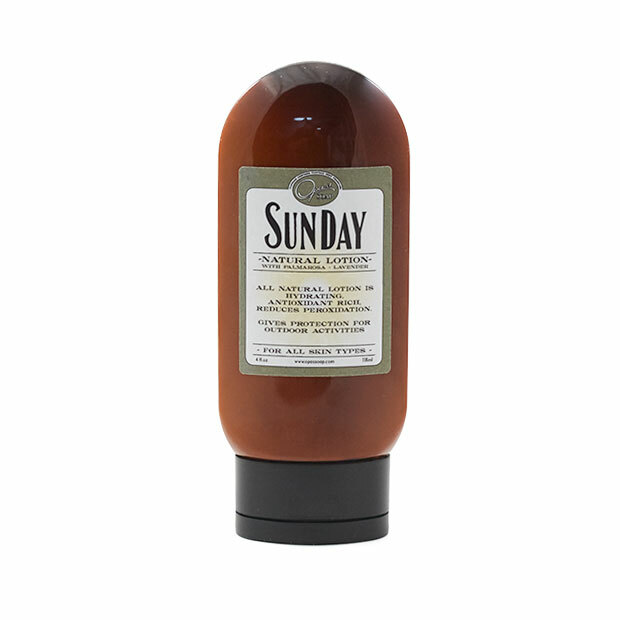 Sunday lotion is designed to stop peroxidation by feeding the skin. Also, by adding Squalane, Myrrhe, and Red Raspberry Seed Oil helps rid free radicals and prevents skin damage caused by over-exposure to sun. Red Raspberry Seed Oil studies show protection against UV-A and UV-B equal to titanium with a SPF of 25-50. 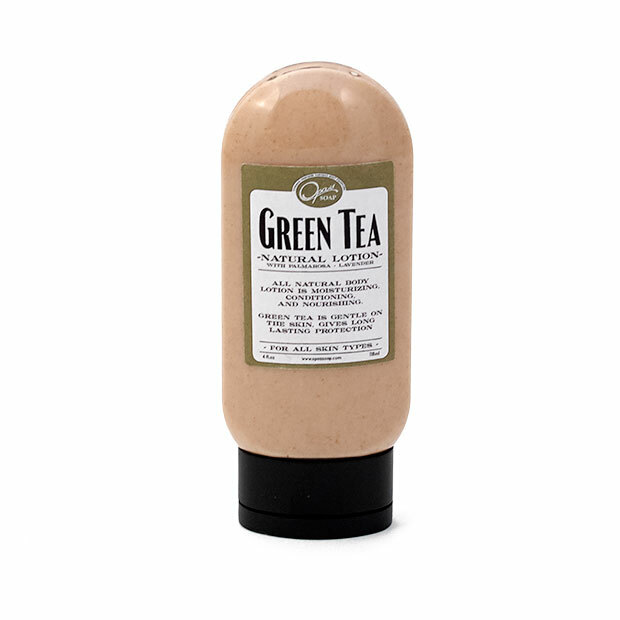 Sunday lotion is filled with antioxidants like White Tea and Green Tea which help keep our skin in the best shape by preventing and repairing damage. Antioxidants help slow the effects of free radicals. Aloe is added to help relieve irritation, soothe, moisturize skin, counter after sun effects, and help speed up healing. Ginko Biloba is added for its anti-inflammatory properties, its ability to repair skin, and increase collagen production. To keep freshness please use within 6 month. Protecting yourself against the sun can be quite challenging without using chemical sunscreens and sunblock. Titanium dioxide, an ingredient in just about all sunscreens and sunblocks has evidence of being a potential carcinogen. There are also active ingredients such as avobenzone, benzophenone, ethylhexyl p-methoxycinnimate, 2-ethylhexyl salicylate, homosalate, octyl methoxycinnamate, oxybenzone (benzophenone-3) that are raising some questions. These ingredients are said to increase free-radicals in the body. EWG has quoted a study conducted by CDC that 97% of Americans are contaminated with a sunscreen ingredient called oxybenzone. Oxybenzone has been linked to hormone disruptions, allergies, and cell damage. They also quoted a study revealed that mothers exposed to this ingredient during pregnancy were subject to have babies with low birth weight. Oxybenzone is a chemical ingredient that helps other ingredients penetrate through the skin. EWG identified 600 sunscreens, 172 facial moisturizers, 111 lip balms, and 81 types of lipsticks sold in the United States that contain the ingredient oxybenzone. Estrogenic activity in sunscreens have been detected. A study conducted by Margaret Schlumpf at the Institute of Pharmacology and Toxicology, University of Zurich, Switzerland have found that many widely-used sunscreen chemicals have estrogenic activity and trigger developmental abnormalities in rats. EWG's research has revealed that 84% of sunscreen products are harmful to consumers. There are ways to increase your protection from bad sunburns and gear your body up to respond better to your prolonged activities in the sun. Eating a wide variety of antioxidants including berries, rich vegetable sources with all spectrums of colors, chlorella, wheatgrass, and spirulina. As well as hempseed, green tea, dark chocolate, white tea, watermelon, tomatoes, and fish oil. A variety of these foods are either high in antioxidants, carotenoids, lycopene, and omega 3 fatty acids. The picture here is of our human test subject, he has volunteered to "test" our Sunday lotion and its effectiveness. The subject drove on a long distance trip, a total of three hours with the left arm exposed directly into the sun. A dot, the size slightly smaller than a dime would be rubbed into a specific area on the arm before the subject started the trip. After the three hour ride, the tester experienced heavy sunburn in all areas of the arm that was exposed to the sun but the area that was neatly covered with our Sunday lotion did not get damaged and retained the natural color of the skin. This is a great sunscreen i have used many times in the past. It goes on very light and is not greasy or sticky. It works great as a daily sunscreen, not to sure about by the beach or pool all day though. I do have to reapply if I'm out in the sun. The smell is not as amazing as the rest of the Opas soaps and shampoos, but thats ok for me. Having a chemical free more natural sunscreen is awesome! Really like this sunscreen. I really appreciate that it contains no zinc oxide, keeps my skin sunspot free even in direct sunlight, and feels very light on my face while wearing. Also blends easily under my make-up. Happy with it so far. I have extremely sensitive skin & haven't been able to use conventional sunscreen in years! I am allergic to titanium dioxide, zinc oxide & all the other chemicals in sunscreens like oxybenzene etc. I tried a sample of the Sunday Lotion & I did not itch, scratch or have any redness or rash!!! It was so wonderful to find a sunscreen I can finally use & not break out! I can finally go out during the day & not to cover my face or wait until evening & night like I was a vampire!! I love the consistency of the lotion that I can use it under my make-up! I hope Mercedes keeps making these!!! Thank you Mercedes for giving me my life back!! I have a terrible allergy to sunscreen. I love the sun and as bad as it is... Sun bathing. I must use some type of sunscreen and had been opting for zinc based, limited ingredient sunscreens. This year, even this has produced allergy results. I came home from a week sunny vacation with a lasting rash on my face and frantically set out to find a new sunscreen option. I ordered 2 bottles of Sunday lotion and it's perfect! It's great for my face and whole body. No rash and so far, good protection from sunburn. I highly recommend this to everyone, especially if you're sensitive to commercial chemical sunscreen. This smells and feels delicious on my skin! I found Mercedes and Thomas at Earth Day on a warm and sunny "Sunday" in Santa Barbara. I have very fair skin and had forgotten to bring my parasol (my usual "sun block") and so bought their Sunday lotion. The lotion is light and non greasy and I'm happy to report I did not burn! What a good find! For the last 15 years I've had issues with sunscreen causing red itchy rashes on my arms at the start of every summer or spring break vacation. No matter which sunscreen I tried and what "non-chemical" or "sensitive skin" formulation I tried, I'd still get the rash. This year I decided to try SunDay. I've just returned from a week in Florida and no rash! SunDay will be my sunscreen from now on. Added bonus, there's no greasy feel or shiny skin after applying. The Sunday lotion feels great so far--it isn't sticky or too heavy and I can wear a light dusting of powder on my face and the lotion+powder combination doesn't turn waxy. The lotion also seems to brighten my face a little, which is a nice bonus!